Updated at 5:42 p.m. on Wednesday, March 27, 2019, with more information. Former Chattanooga prosecutor and current defense attorney Gerald Webb interviews for General Sessions Court judge before members of the Hamilton County Commission in the County Commission assembly room at the Hamilton County Courthouse on Wednesday, March 20, 2019 in Chattanooga, Tenn. Current General Sessions Court Judge Clarence Shattuck, 83, announced he will retire on April 1. The Hamilton County Commission made history Wednesday by voting for Gerald Webb to become the next judge in General Sessions Court, marking the first time a black man will hold a countywide judgeship. Commissioners voted 8-1 to have Webb, a former prosecutor, defense attorney and a board member for Erlanger hospital and the county school district's task force for failing schools, replace Clarence Shattuck, who has been on the bench since 1982. "I don't like to be in the promise business, but I promise this: You will never have any reason to doubt this vote," Webb told commissioners after he was chosen. "I will do the very best job I can. Thank you again for the opportunity and chance, and I promise I will not let you down." Nineteen people applied for the judgeship, which is the starting place for roughly 50,000 criminal and civil cases yearly, after Shattuck announced his retirement last month. Shattuck's last day is Friday. Commissioners interviewed 17 of the candidates last week and made their nominations Wednesday morning after a heated discussion about whether the county should work with the city on county sewage treatment operations. Commissioner Warren Mackey nominated Webb while Commissioner Tim Boyd nominated Cris Helton, a former court clerk, prosecutor, East Ridge city attorney and current judge over East Ridge City Court. Webb received eight votes, with only Boyd casting support for Helton. Though two black men have been judges in Chattanooga City Court — former assistant city attorney Bennie Harris was appointed in 1969 and attorney Walter Williams was appointed in 1991 — a black man or woman has not been judge in the county's General Sessions courts. Elsewhere in Chattanooga, Curtis Collier was the first and remains the only black federal judge in the U.S. District Court for the Eastern District of Tennessee since his appointment in 1995. 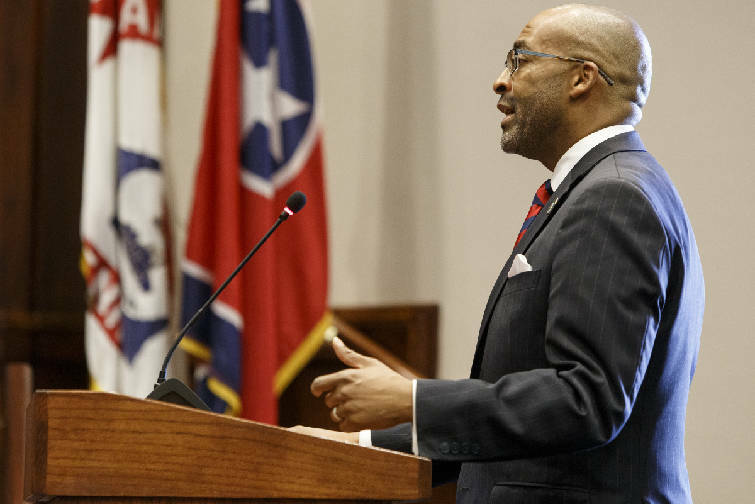 And at the state level, attorney John McClarty was appointed to the Tennessee Court of Appeals for the eastern section in 2010, making him the first black state judge to serve Eastern Tennessee. "I would just like to thank the commission for the vote that you all gave today," Hamilton County Attorney Rheubin Taylor told the commissioners after the vote. "I've been an attorney for 46 years, and at one time when I first started I was the only black attorney, and for you all to put someone on the bench today after 46 years I'm just so proud of you." Webb will start the job Monday. The Times Free Press failed to mention an additional black attorney who previously held a judgeship in Chattanooga's City Court. In 2003, former Hamilton County assistant district attorney John Millican was appointed to fill the term of Chattanooga City Court Judge Walter Williams. Millican was elected to the position for a full term in February 2004 but sadly passed away due to complications from diabetes in June 2004.